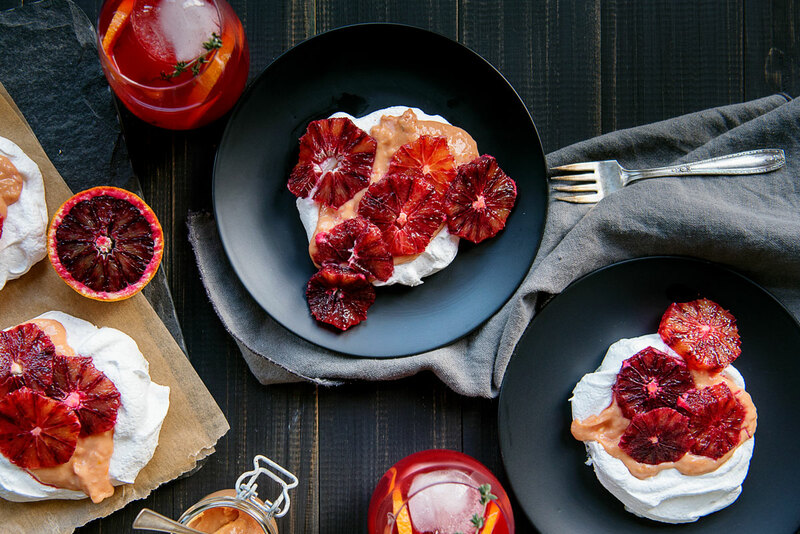 This mini pavlovas recipe with blood orange curd has individual vanilla bean pavlovas and a tart and sweet blood orange curd. They look fancy but are so easy. 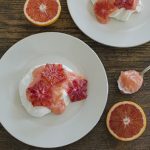 After the first bite of these mini vanilla bean pavlovas with blood orange curd, Pat pronounced them one of the best desserts he has ever had. I can’t make this stuff up folks! Given how easy these were to whip up, it’s safe to say I’ll be making pavlova more often. I’m glad you asked! If you’ve never had pavlovas, they are basically slowly baked meringues that form a crunchy outer shell but retain a soft and chewy inside. It’s the perfect mix of textures in every bite. 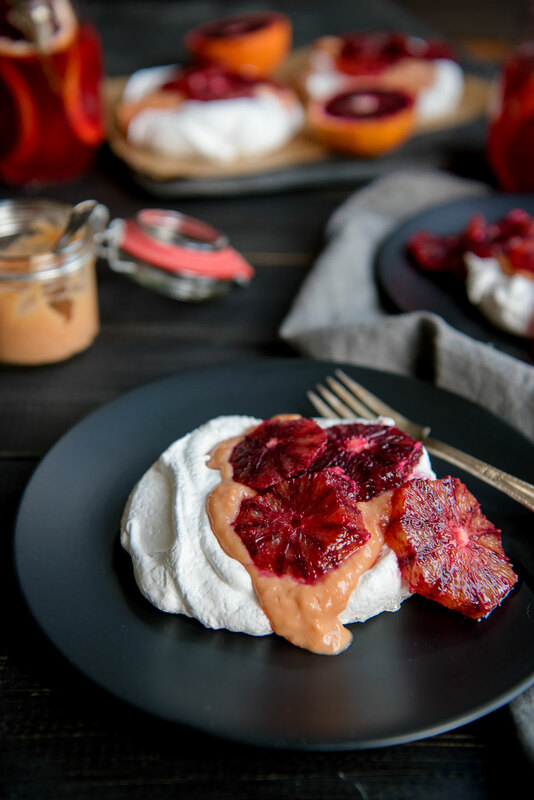 Sometimes pavlovas are large and sliced into sections for serving, like this pavlova topped with rhubarb curd. In this case, I made mini, single-serving pavlovas which I think I might love even more than I love the large ones. In less than two weeks, residency placements will be announced, in a fun-but-terrifying “ceremony” held by the medical school. Basically, the residency placement process after medical school involves you making a ranking list of all the places you interviewed at, and the programs do the same of all the applicants that they interviewed. A giant computer locked in a super secret location (at least that’s how I envision it) combines all the data and spits out your perfect “match”. It sounds like speed dating, doesn’t it? Matches are revealed on March 15th. The ceremony involves people opening their match letter and reading it out loud in front of the whole school. 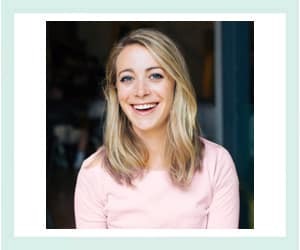 As someone who doesn’t like surprises, this sounds horrifying to me! I’m planning to open my letter in private with Pat instead, even if that makes me a wet blanket. Add salt, cream of tartar and the seeds from vanilla bean. Continue beating on high until mixture is glossy and stiff peaks form. Drop 8 scoops of the mixture, about 1/2 cup each, onto a parchment paper lined baking sheet. Use a spoon to make a well in the center of each meringue. Bake for 2 hours at 200° Fahrenheit. Turn the oven off and allow meringues to cool in the oven with the door ajar for 2 more hours. A wooden spoon works well to keep the door open. Pavlovas can be stored at room temperature in an airtight container for up to three days. Whip the cream and sugar until it holds a soft peak. 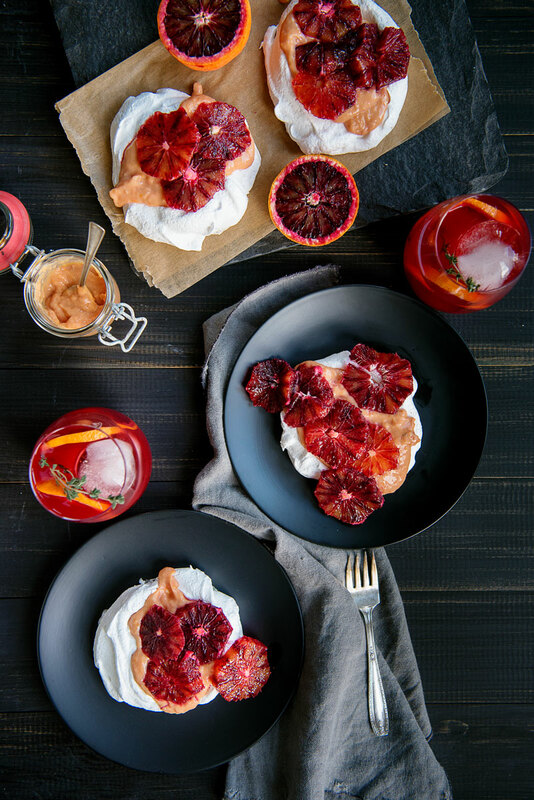 Layer the homemade whipped cream and blood orange curd onto each mini vanilla bean pavlova. Garnish with sliced blood oranges, if desired. P.S. 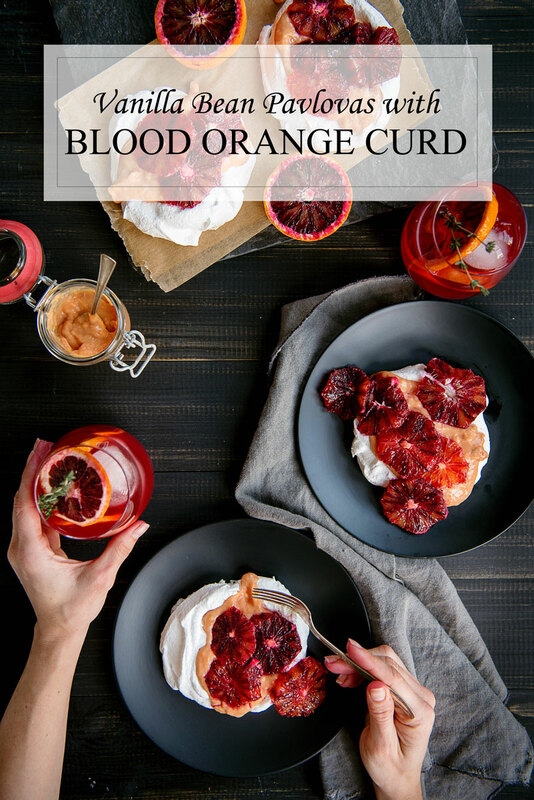 – This recipe is an update from one that I originally posted in March 2013, back when I was in medical school as you may have noticed! In case you’re wondering, I ended up ‘matching’ in San Francisco and we’ve lived here ever since! 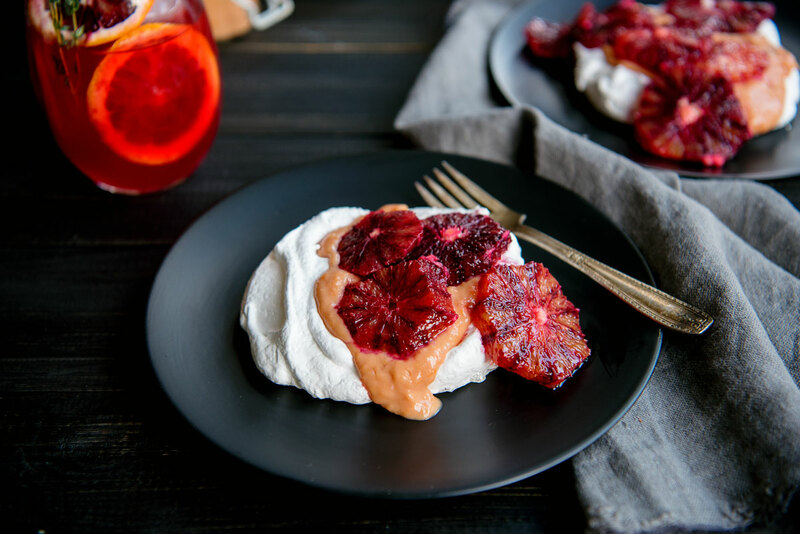 Do I have you craving blood orange pavlovas? Pin this recipe for later! Can the pavlova be made a day or two ahead, or do they need to be made the day they are served? Looks delicious-thanks! Good question! You can make the pavlova and store it at room temp in an airtight container for up to three days. I’ll add that to the recipe! These look so lovely! 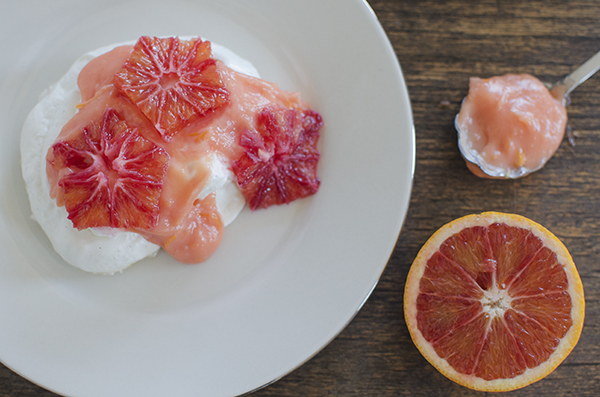 Pavlovas are one of my favourite desserts to throw together, I can’t wait to try making the blood orange curd. Hey Katie! I actually “matched” almost a year ago. I got my first choice and now we’re living in San Francisco! Good luck on med school applications!